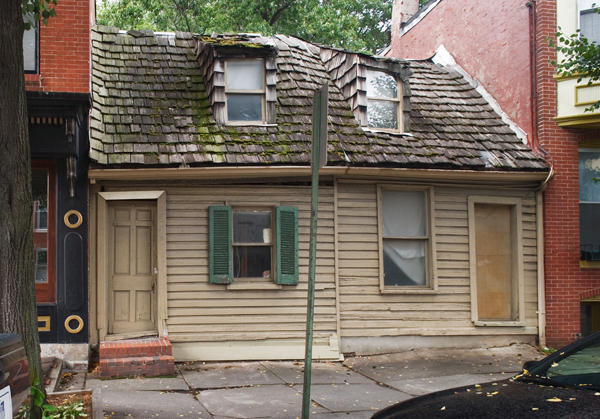 Once a staple of the Baltimore landscape, wooden houses of the late eighteenth and early nineteenth centuries are now an endangered resource in Baltimore. The neighborhood of Fell’s Point has the highest collection of remaining wooden structures: eight. The number of these early wood houses has dwindled over time. In 1798, there were over 400 wood houses; in 1880 there were 280; and today there are eight. Stacy Patterson worked with Baltimore Heritage in 2006 to identify the remaining wooden houses from the late 1700s and early 1800s in Fell’s Point. Wood houses date to the earliest development of Fell’s Point, but really took off when Ann Fell took over the task of developing Fell’s Point in the late 18th Century. To maximize sales (and profits), she imposed a covenant on each lot she sold requiring the owner to develop a house not less than 400 square feet within 18 months. As wood was the most prevalent building material, the fast growing Fell’s Prospect (as it was then called) developed largely with this material. In 1799, the fear of fire prompted city officials to prohibit building new structures of wood within the city center. Although the ordinance did not apply to Fell’s Point, new construction increasingly was accomplished with brick here as in downtown Baltimore. The remaining wood houses range from simple single room dwellings to multi-story buildings three bays wide and with dormer windows.